On October 12th, 2014, I stopped the indoors aquaponics system, after a psycho Tiger Tilapia killed all other fish in the tank, then died miserably. Fish tank rinsed with water, and brushed all the dust, salt, and residue. No detergent or disinfectant were used. We didn't want to risk harming the growth of new bacteria. New (very bright) LEDs were installed. Let's encourage the growth of plants with more lumens. I hope the LEDs will be in the correct spectrum for the plants. 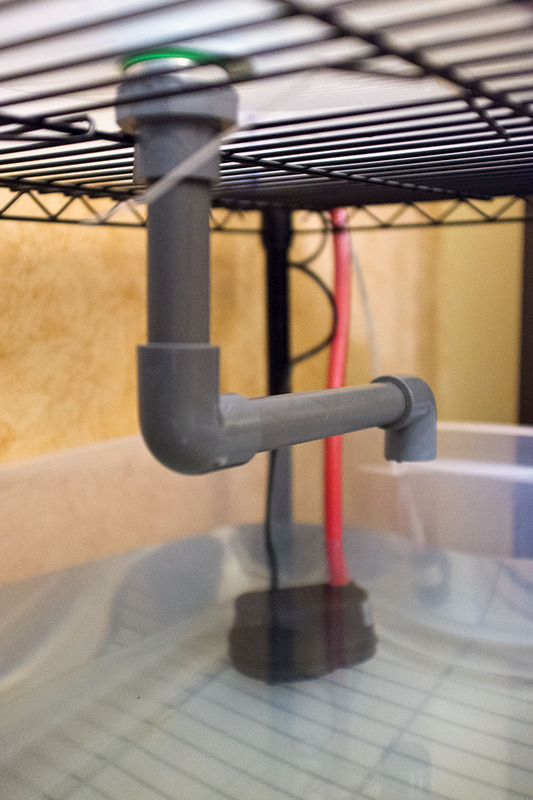 I will keep the water circulating (fill - flush) for a week, before introducing some goldfish and fully grown plants. They're usually very affordable (mint goes for less than US$0.50 a pot), but not organic. Only 4 LED bulbs were introduced, as they were expensive and I wasn't sure they would work. Update March 17th, 2016: I scattered some arugula (rocket - جرجير) seeds all over the hydroton, just as a progress baseline. I was surprised it actually flourished. Aquaponics is a sustainable food production method, that combines aquaculture (growing fish for food) with hydroponic (growing plants in water). Plants grow faster, healthier, and with a delicious richness in taste. On the other hand, you're also maintaining a nice supply of edible fish, such as Tilapia. 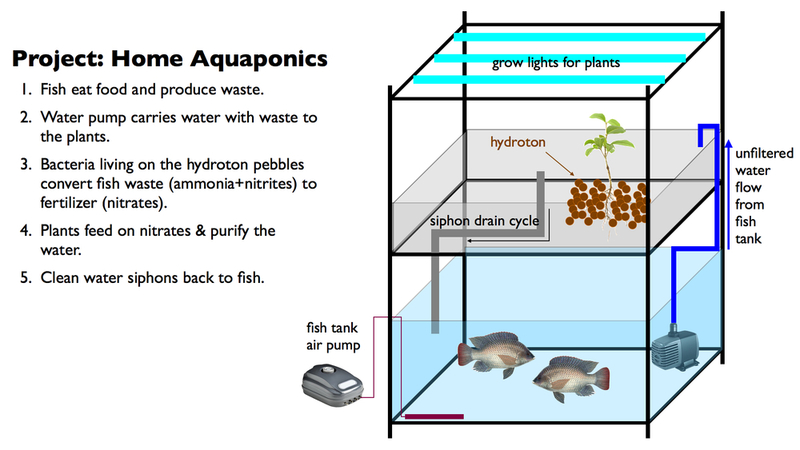 I've been reading about it for almost a week now, and I think I'm ready to start my home aquaponics project. It takes a few weeks for the system to kick-in.. Bacteria will need time to grow and populate the plants' grow bed. Oxygen is important for the fish, plants, and bacteria. So, make sure it's available. Since this is an indoors setup, grow lights are important for your plants. If you're using edible fish, such as Tilapia, make sure you read about their reproduction requirements and caring best practices.